BOOST MY FUEL is Your Business! Go Green Save Green, Better Than Money in The Bank! Home / Automotive / BOOST MY FUEL is Your Business! Go Green Save Green, Better Than Money in The Bank! Until very recently, Boost Fuel Saver was only available in large bulk containers. However, it is now package for the general public and business community as well. Boost My Fuel is on the “cutting edge” of fuel technology with a world class laboratory. Boost My Fuel products are manufactured with over 60 years of experience and history, providingadvanced fuel solutions and improving the performance and reliability of fuels for users such as: Railroad Locomotives & Equipment, Marine Vessels, Major Utilities Power Plants, Generators, Mining Equipment, the US Government, Fleet Vehicles and Service Trucks, Private Companies, and Corporations. If Boost Fuel Saver is capable of meeting these rigorous standards, imagine what this comprehensive industrial fuel improver will do for your engine, too! Sign up is quick and easy, for any businesses to earn commissions and save money. And super product for consumers to increase fuel mileage (MPG), and extend engine life, thereby saving money in many ways. Boost Fuel Saver, is a concentrated fuel improver, used to minimize maintenance cost, extend engine life, increase performance, reduce fuel consumption, reduce harmful emissions & pollutants, for use in Diesel, Gasoline, or Bio-Fuel Blend Fuels. Stationary Power Plants/Generating Stations, and Portable Generators. *Over 60 years of experience and history with Boost Fuel Saver products and services. *State-of-the-art laboratory excelling in petroleum chemical engineering, organic chemistry and corrosion. engineering, providing top quality fuel analysis, fuel troubleshooting and problem solving. *Unparalleled sales and technical support. *Unmatched credentials and capabilities industry-wide. *Increased combustion efficiency of both diesel and gasoline engines. Boost Fuel Saver is a unique blend of oil soluble organo-metallics which results in better overall performance of your internal-combustion engine. 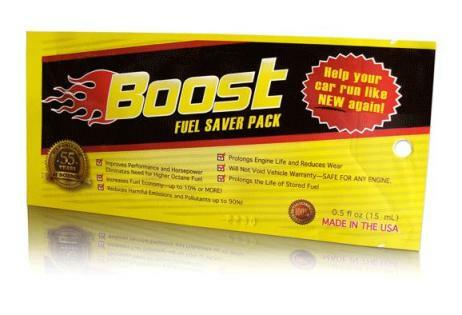 When added to gasoline or diesel fuel, Boost Fuel Saver increases the combustion efficiency of your engine. A catalyst of any type is something that will speed up a reaction or allow a reaction to take place at a lower temperature. In our case the catalyst lowers the ignition temperature of the hydro- carbon that normally ignites around 1200 degrees Fahrenheit to a temperature of about 800 degrees Fahrenheit. Which helps to facilitate a more efficient complete burn of individual hydrocarbons. By producing a more complete burn, the most available BTU’s(energy) in that gallon or lb. of fuel will be used. It does not increase BTU’s but allows the combustion process to convert more of the available BTU’s into energy. Boost Fuel Saver lowers the ignition temperature of the Hydrocarbon by 400 degrees Farenheit (204 degrees Celsius). By burning hydrocarbons more completely there is less unburned or partially burned fuel going up a stack in the form of particulate emissions. a.) Increases the combustion efficiency, by using more BTU’s of the fuel. b.) Provides a more efficient combustion process by lowering the ignition temperature of the hydrocarbons. This allows more of each fuel particle to burn more efficiently in the combustion chamber. (c.) Prevents soot particles from adhering to equipment and metal surfaces. Carbon is the glue that holds lower melting point materials together. These materials form slag deposits on equipment. They are hard abrasives that accelerate wear, and hold heat and cause torching of exhaust valves. The catalyst allows the formation of higher melting point materials that keep the available Vanadium from forming Sodium Vanadyl Sulfate. (Sodium Vanadyl Sulfate is a major abrasive deposit that destroys valves) Boost Fuel Saver, contains inhibitors and sludge dispersants which minimize particulate, allowing improved combustion with less soot and gummy deposits on fuel metering equipment, injectors, and Turbo Chargers. These same inhibitors and dispersants are powerful cleaners that maximize engine efficiency. (e.) Stabilizes the natural chemical activity of fuel, preventing formulation of fuel particulate. (g.) Includes detergents for both gasoline and diesel engines. (h.) Lubricates fuel pumps, injectors and upper cylinder walls. (i.) Includes corrosion inhibitor to keep metal components of the fuel system like new. (j.) Demulsifies to keep water out of the fuel. (k.) Prolongs the life of stored fuel, ensuring fuel reliability. The highly concentrated blend of ingredients in Boost Fuel Saver (1/2 fl oz. or 15mL treats between10 – 40 gallons AND double doses **10 – **20 gallons, of diesel, gasoline, or bio-fuel blends) Regular use of Boost Fuel Saver will allow for optimum results in engine performance when combined with regular and scheduled maintenance of any internal-combustion engine. Boost Fuel Saver allows the use of lower octane gasoline, and lower quality fuels, with no decrease in engine performance. To witness similar benefits without using Boost Fuel Saver, you would have to purchase the highest grade premium fuel, spending $.20 – $.30 cents more per gallon, in addition to using multiple individual additives. Some engine manufacturers may require or recommend Premium Fuel, check the manufacturer’s owner manual for instruction. It is recommended to use Boost Fuel Saver every time you fill-up. Witness improvement in fuel mileage usually between 3 – 7 tank fuel tank treatments on average. ** It is recommended to double-dose at least the first 3 tank treatments. ** Some users always double dose, while others *single-dose in new or newer engines with low miles. * Use Boost Fuel Saver, every time you fill-up, and witness the benefits! (1.) Fuel Injector Tips, and Atomizing Orifices. (2.) Fuel Pumps are more lubricated, and the polymerization retardant keeps diesel fuel pumpable. (3.) Fuel Filters stay cleaner for longer periods of time. (4.) Valves and Valve Guides, show less torching and carbon build-up. (5.) Combustion Chamber, is free of carbon deposits, or significantly reduced. (6.) Top End Lubricant, provides additional lubrication to upper piston cylinder walls, and piston rings. (7.) EGR Valves are cleaner, due to more complete fuel combustion. (8.) Rust and Corrosion Inhibitors, prevent Fuel Tank and Fuel System corrosion caused by oxidation and condensation. (9.) Smoke Stack/Exhaust – The combustion catalyst in Boost Fuel Saver provides you with greater fuel efficiency. In comparative tests, the additive decreased combustible carbon residue 60 to 90 percent. These results are evidence of more complete combustion. Also, the resulting lower carbon residue indicates more BTUs (power) per pound of fuel were burned. Therefore the effect of Combustion Catalyst burn-rate modifier is twofold. More complete combustion produces more useful energy while reducing soot and smoke. (10.) Turbo Chargers – Due to a more complete combustion of the fuel, there are reductions in unburned carbon. The polymerization inhibitor in Boost Fuel Saver, prevents the hydrocarbon molecules from restructuring into bigger chains, and there is less residue available for unintentional return to the turbo charger. Kelly Brooks, President of Boost My Fuel. Flagstone Walkway – Planning on Designing a Curved Flagstone Walkway?